What Is Edutainment and Does It Work? Employers are beginning to spend more money than ever before on their training initiatives and tools. Yet one source indicates that less than 30% of all training being executed is actually being used on the job a month later. So, while employers on average are starting to spend a lot more resources on new technology platforms and training initiatives, such investments don’t seem to be entirely foolproof or indicative of a healthy return on their training investments. One cause for ill-fated training investments could be due to faultily applied edutainment. Continue reading to learn more. 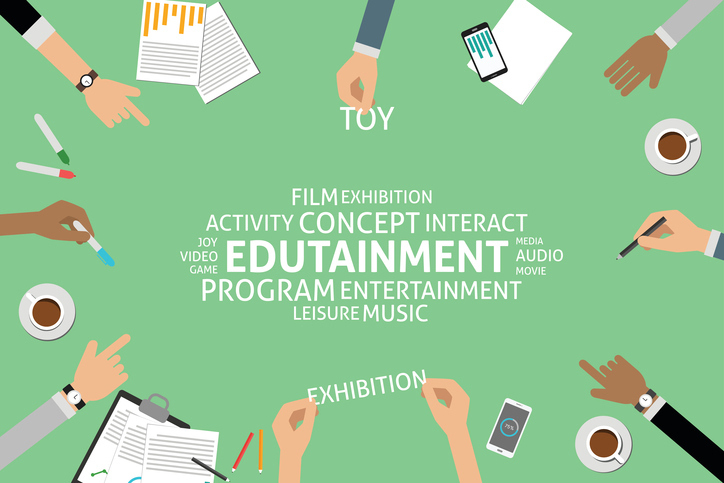 What Is Edutainment in the Workplace? Edutainment is learning content that is distributed in a traditionally entertaining way, typically via video content, games, or virtual simulations. The main goal of edutainment in the workplace is to educate an audience of employee learners while simultaneously amusing them. So, gamified learning content where employees earn badges for correct responses as they learn could be an example of edutainment. And humorous videos where actors are acting out scenes involving customer service case scenarios might be another example of edutainment, and so on. The main idea behind edutainment is that when learning content is entertaining, it’s more likely to stick with the learners because it’s amusing and easy to follow. Learners simply must view what’s in front of them and be entertained, and they aren’t required to parse through abstract concepts or do anything overly complicated. However, new research and studies have indicated that edutainment alone doesn’t prove as valuable as it was once thought to across sectors. Gaining your learners’ attention isn’t enough, as they will most likely forget what they were entertained by shortly after it’s over. In other words, edutainment is short-lived if its only goal is to entertain; it must also engage your learners and teach them something if it’s to remain effective. Bottom line: Edutainment doesn’t equal engagement or knowledge retention on its own. If you want your video training courses, gamified learning content, and other “entertaining” learning initiatives to be impactful and effective, you must also ensure that real learning is taking place. Your learners must be able to recall the information they’ve encountered and been entertained by, and they must be able to prove that they have understood the learning content they’ve encountered and been entertained by, which means there must also be a clear learning objective for each piece of learning content that’s entertaining. What new studies and other information have uncovered is that edutainment isn’t necessarily effective on its own as a learning strategy. Yet, it does still have some value and merit. So, what can you do to ensure your entertaining learning content is also effective? Watch out for tomorrow’s post to learn more.